The site of the 800 MW Parbati (stage-II) power project. A team of experts from the Indian Institute of Technology (IIT), Roorkee, has recommended stabilisation of the entire slope near the High Court and undertaking geological studies of the rock strata before taking a decision on the construction of lawyers’ chambers at the site. Seeking immediate intervention of the state government, the St Bede’s College Lecturers Association today demanded the appointment of an administrator to resolve the stalemate in the institution following which teaching has been suspended since July 9. The joint action committee of the Himachal Road Transport Corporation (HRTC) staff organised a dharna here today in protest against the alleged failure of the government and the management to implement the June 18 agreement regarding its demands. Former Chief Parliamentary Secretary Babu Ram Mandial today formally joined the Himachal Lokhit Party (HLP) along with hundreds of his supporters at a function organised at Gagal in the Nadaun Assembly constituency in the presence of state convener of the HLP Maheshwar Singh. 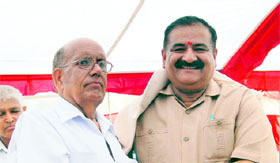 Babu Ram Mandial and Maheshwar Singh. Taking a serious note of encroachment on forest land, the Himachal Pradesh High Court has directed the Chief Conservator of Forests, Kangra, to furnish the details of all those who have encroached upon forest land in Dharamshala circle. All-India Congress Committee observers today described Virbhadra Singh a prominent leader of Himachal Pradesh and said if the party high command asked him to lead in the state, it would be in the party interest. Both Indian and Russian trustees of the International Roerich Memorial Trust (IRMT), Naggar, have reportedly decided to settle all pending issues at an executive meeting of the trust to be held soon. Workers, under the banner of the Left wing CITU Union, protested at the project site of the 105-MW Uhal-II at Jogindernagar today demanding the release of their provident fund (PF) statement, which has not been issued for the past two years. One more Tibetan monk, Lobsang Lozin, has reportedly committed self-immolation. With today’s incident, 44 Tibetans have reportedly committed self-immolation in Tibet. One Tibetan had committed self-immolation in Delhi. The government has deferred the ban on gutkha and other tobacco products till October 2, following a request by retailers. The “callous manner” in which the Congress high command has constituted the election campaign committee and made belated appointments of secretaries of the party has left the cadres wondering if the party is serious about winning the Assembly poll in the state. The Himachal Pradesh State NGOs Federation has expressed confidence that the pro-employee government of Chief Minster Prem Kumar Dhumal will accept their pending demands in the JCC talks being held by a faction of the federation tomorrow. Gulam Ali of Malerkotla was killed on the spot, while three others were seriously injured as the jeep (PB-13U-6986) in which they were travelling fell 70 foot down in a gorge near Gambhrola on the National Highway No. 21 (Chandigarh-Manali), 18 km from here, today. The 800 MW Parbati (stage-II) project, part of the 2,013 MW Parbati project, Asia’s biggest hydro-power project on the Parbati river here being executed by the National Hydroelectric Power Corporation (NHPC), has been pushed 10 years behind schedule as the NHPC has rescinded the contract for the construction of a 30-km tunnel after Satyam, the company which was allotted the contract, failed to complete the tunnel work. This in turn has pushed up the cost of the project by Rs 1,300 crore from the earlier cost pegged at Rs 2,700 crore. The NHPC has taken the custody of the machinery from the defaulting company as it failed to complete the work. The company has constructed 25 km of the 30-km-long head race tunnel from Pulga, the site of an 85-metre-high dam, to the Siund powerhouse, but it failed to complete the remaining 5 km, according to NHPC engineers. The NHPC has barred the firm from participating in fresh bids, likely to be invited in December. However, the NHPC is yet take any punitive action against the faltering firm. “We had no choice but to rescind the tunnel contract as the contractor failed to construct the tunnel,” said AK Singh, General Manager, Parbati-II. Former Prime Minister Atal Bihari Vajpayee had laid the foundation stone of the Parbati project in 2000 and it was supposed to be commissioned in 2007. The project will produce 3,160.66 million units every year. The project has been surrounded by problems and controversies right from the beginning. A flash flood at Pulga, the site of the dam, water ingress in its tunnel and the tunnel boring machine getting stuck in mud discharge inside the tunnel kept NHPC engineers on their toes. These hiccups cost the NHPC crores of rupees, pushing up the cost of the project. This was followed by CBI raids on godowns of the NHPC and the contractor in Chandigarh and at the project site in which the CBI detected a multi-lakh cement scam. The probe is still under way. Engineers said the project was scheduled to be commissioned in 2007 at a cost of Rs 2,700 crore. However, it got delayed due to many reasons, including a difficult terrain. The NPHC has now revised its cost and schedule. “Most civil works and the powerhouse are nearing completion. However, due to a delay in the tunnel work, we will not be able to commission the project before 2017 and the cost may run over Rs 4,000 crore now,” said AK Singh. The Shimla Municipal Corporation (MC) today placed the report given by the IIT, Roorkee, before the Chief Secretary so that a final decision in this regard could be taken. A high-level committee comprising representatives of various departments, including Public Works, Forest, Revenue, Town and Country Planning and Urban Development, had taken a decision to rope in experts from the IIT, Roorkee, before taking any decision on the construction of the lawyers’ chambers. The team of experts, headed by Dr Ashok Jain, head of the civil engineering department at the IIT, Roorkee, submitted its report to the municipal corporation here yesterday. On June 25, the team had visited the site along the Cart Road adjacent to the High Court where work on the construction of the lawyers’ chambers was under way. The situation worsened when the road connecting the High Court caved in following heavy rain. Though work on the lawyers’ chambers has been stopped as efforts are afoot to stabilise the slope and restore the road connecting the High Court, the monsoon has made the task difficult. In fact, with a portion of the garden of Hotel Clarkes, owned by the Oberoi group, getting damaged, a threat has been posed to the hotel. On July 15, the management of the Clarkes hotel had shifted their guests to its another hotel and ordered the closure of the property till the monsoon ended. The hotel management said with the report of the structural engineers indicating a threat to the building, it had been decided to close the operations till the road was restored and the area stabilised. The MC had said the task of stabilising the site should be assigned to the PWD. At present, a contractor is undertaking the task of stabilising the site and restoring the road. In fact, the pedestrian path restored to facilitate movement for people also caved in following a downpour. The association, led by Ajay Sud, president of the lecturers’ association, and Mathew Kuriakose, president of the Non-Teaching Staff Association, met Chief Minister PK Dhumal, here today. They also met Sanjay Murthy, Secretary, Education, seeking the appointment of an administrator to streamline the functioning of the college. The Chief Minister said the state government was doing its bit by providing 95 per cent grant to the college. “The college is a century-old institution with a great tradition and history and under no circumstances should the studies of the students be affected,” he said. The Chief Minister directed the Secretary, Education, and the Director to convene a meeting of the management and the teaching staff so that the impasse could be resolved amicably. The staff brought to the notice of the Chief Minister the issue of the sudden reduction in their employees provident fund (EPF) from 12 per cent to a mere Rs 780. “This move will drastically reduce our pension even though most of us have put in over 30 years of service,” they lamented. They pointed out that all EPF regulations for privately managed colleges were laid down in the HP University Statute and the management had to abide by these rules. They also raised the issue of the wrong constitution of the governing body of the college, which was not as per the Statute of the HPU, resulting in the management taking autocratic decisions. The teachers also raised the issue of the management failing to pay them their dues, including DA. A spokesperson for the committee said the employees were left with no option but to revive the stir which they had deferred following the June 18 accord, which was to be implemented within 15 days. The management had not taken action on most of the agreed decisions and instead it had backed out of the decision to grant dearness allowance to employees recruited on a contract basis. The demand for bringing booking agents under contract staff had also not been implemented. The government and the management had betrayed the employees by not implementing the agreement. The other demands include regularisation of the services of bus conductors recruited in 2002, release of all allowances and implementation of the High Court verdict with respect to the workshop staff regarding the 1986 pay scales, besides initiating the process for promotion of various cadres. 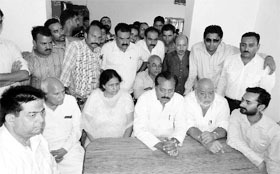 Mandial, who has been active in politics for over five decades, has had a stint both in the Congress and the BJP and was elected twice from the Nadaun Assembly constituency, once on the BJP ticket and once on the Congress ticket. He also remained chairman of Kangra Central Cooperative Bank. Mandial was suspended from the BJP a few months ago. Addressing a gathering on the occasion, Mandial lashed out at the UPA-led Central Government and the state BJP government for allegedly following “anti-people policies” and for failing on all fronts. Mandial criticised the state government for allegedly patronising corrupt leaders and said corruption was at its peak and the state government was not addressing the basic problems of the people. A green bench comprising Justice Deepak Gupta and Justice Sanjay Karol passed this order after perusing the affidavit filed by the Deputy Commissioner, Kangra, wherein it was informed that there were more than 200 cases of encroachment on forest land in and around McLeodganj. The Bench directed the Chief Conservator of Forests to file an affidavit in this regard and give details of the proceedings against persons who had encroached upon forest land. It also granted time to the Central Tibetan Administration, Dharamsala, and the Jigger Kagyud Studies and Mediation Centre, Rewalsar, Mandi, to file a reply on the issue of alleged encroachments on forest land by Tibetan refugees. The matter has been listed for further hearing on August 3. The Bench passed this order on a PIL filed by Pawan Kumar of Rewalsar in which he alleged that Tibetan refugees had encroached upon thousands of bighas of forest land in Kullu, Mandi and Kangra districts. The court also directed the DCs of Mandi and Kangra to file fresh affidavits regarding steps taken by them to ensure that rocks and big boulders were not defaced. To check the speed limit on sealed and restricted roads of Shimla town, the HP High Court has directed the committee, constituted under the Himachal Pradesh Road User Act, 2007, to report within two weeks about the installation of speed-check and CCTV cameras on these roads. A Division Bench, comprising Justice Deepak Gupta and Justice Surinder Singh, observed that so often speed limit was violated on sealed and restricted roads. The Bench further observed that every person, howsoever high, was bound to follow the speed limit. The court also said taxis operating through the HRTC were also flouting the speed limit. The court passed this order on a petition filed by Neelam Sharma wherein the petitioner had also raised the issue that funds collected under the aforesaid Act were not used for the welfare of the pedestrian of Shimla. The petitioner submitted that under the Act a committee of Divisional Commissioner, Deputy Commissioner, Superintendent of Police, Shimla, and Commissioner, Municipal Corporation, Shimla, had been constituted to take effective steps for providing facilities to pedestrians, but no steps had been taken by the committee. Dr Shalinder Mohan, MLA, Uttarakhand, and Shamsheer Singh Goggi of the Haryana Congress Committee, Kangra district Congress party observers, said this during a press conference here today. They said they were overwhelmed by the enthusiasm among Congress workers and leaders. Both the observers were here to judge the mood of Congress workers at the grassroots level. Thirteen Congress Block presidents with their supporters met the duo today. The meeting, which was organised by the District Congress Committee, was presided over by DCC president Suman Verma and attended by block presidents, former and sitting MLAs, former MP Chander Kumar, senior Congress leaders and workers and sitting MP from Rajasthan Chandresh Kumari. GS Bali, however, was not present in the meeting and according to the DCC president, Bali was in Delhi in connection with party affairs. Regarding ticket distribution, both Congress observers said their job was to observe things at the grassroots level and the Central Election Committee would finalise the candidature based on a criterion fixed for the same. Third observer Ghulam Ahmed Mir, MLA, Jammu and Kashmir, could not attend today’s meeting. DCC chief Suman Verma denied that she was an aspirant for the Kangra Assembly seat because this seat was reserved for Other Backward Classes. Both Indian and Russian trustees of the International Roerich Memorial Trust (IRMT), Naggar, have reportedly decided to settle all pending issues at an executive meeting of the trust to be held soon. They have also decided that the Roerich museum will have two curators, one from the Russian side and one from Himachal. According to sources, three trustees - Russian Ambassador Alexander Kadakin, who is a lifetime trustee, Deputy Commissioner, Kullu, Amitabh Awasthi, who is the treasurer of the trust, and Director, HP Art, Language and Culture Department, Rakesh Kanwar, a member of the trust, held brief discussions at Naggar on Sunday evening. They decided to convene a meeting of the trust soon to settle all pending issues. The trustees had come to Naggar to celebrate the 20th anniversary celebrations of the IRMT, which concluded on Sunday. Though there are 17 trustees of the IRMT, most Indian trustees were conspicuous by their absence. Many senior officials from the Russian Embassy were present. A team from the International Centre of the Roerichs, Moscow, currently engaged in the preparation of an inventory of the museum and Kullu ADM Kamal Saroj also participated in the event. The Kullu Deputy Commissioner said they had agreed to appoint two curators, one from Himachal and one from the Russian side, to manage the affairs of the trust. Earlier, the Russian Ambassador, during his address at the inauguration of the IRMT’s 20th anniversary celebrations, defended Alena Adamkova, the IRMT’s controversial curator, and praised her contribution to the museum and the trust. According to workers’ leaders, Sher Singh and Kishan Singh, Beas Valley Power Corporation Ltd (BVPC) has not issued the PF statement in the account of the workers for the past two years. They have been getting false assurances from the government-run corporation since last year, they claimed. They stated that if the PF statement was not issued by July 22, they would intensify the protest, for which the corporation would be responsible. Over the past one year, there have been sustained incidents in which Tibetan monks have committed self-immolation in Tibet demanding freedom for Tibet and the return of the Dalai Lama. Though these incidents have managed to attract the attention of human rights bodies and the media across the world, these do not seem to have made much impact on the Chinese authorities. The Chinese administration has, in fact, started to strengthen its control over Tibetan monasteries which, it believes, have been home of monks who have committed self-immolation. None of the countries has come out openly to criticise China over self-immolation being committed by Tibetans. The Chinese authorities have increased diplomatic pressure on many countries against keeping any relation with the Tibetan administration-in-exile. Recently the Australian Prime Minister refused to meet the Dalai Lama on his visit to the country. A spokesperson for the Central Tibetan Administration, in a statement issued here, said “it has been learnt with deep concern that the latest self-immolation incident, which took place today, has led to the death of an 18-year-old Tibetan monk in Ngaba in north-eastern Tibet”. Lobsang Lozin, a monk of the Gyalrong Tsodun Kirti Monastery in Bharkham, set himself on fire raising slogans against China. He died on the spot. On March 30 this year, two monks from the same monastery, Chime Palden and Tenpa Dhargyal, had committed self-immolation. It was after a meeting of retailers with the Chief Minister here today that a decision was taken in this regard. Dhumal said a decision had been taken to ban gutkha and other tobacco products to save youth from getting addicted to it. He said the government was maintaining a strict vigil on the sale of tobacco products to schoolchildren and youth. He said the decision to defer the ban had been taken in view of the request by retailers to exhaust their available stock and at the same time diversify their trading activity to earn a livelihood. He said the last date was October 2 and after this there would be no extension of the ban. The composition of the jumbo-sized campaign committee makes it evident that it has been constituted without due application of mind and ignoring the ground realities. Even if the objective was to accommodate leaders of various factions, the purpose has not been served. Supporters of all factions are totally disillusioned and they maintain that the casual approach of the high command has undermined the sanctity of important party panels. The high command has not learnt any lesson from the “leak” of its charge sheet, which was released by the BJP much to its embarrassment. The committee has been saddled with at least four very old leaders who have already become inactive due to their advancing age. Further, many of the members will be in the fray for the Assembly poll and with a few exceptions, they will be in no position to leave their own respective constituency even for a day to make any useful contribution as member of the committee and further the party’s prospects. Besides, some prominent leaders are being included in every committee as a matter of routine. There are three women, two of whom are from Kullu, including Uma Gaur, wife of a former minister, the late Rajkrishan Gaur, who has no political experience. The list of the newly appointed secretaries has some names which are unfamiliar to most senior party leaders. The high command has not as yet approved the list of members to be co-opted to the PCC to make up for the shortfall in the representation of women and to accommodate some deserving leaders who failed to make it through the election process submitted by state party chief Kaul Singh more than 18 months ago. However, it has appointed 16 secretaries, most of whom are not members of the PCC, and they have also not been co-opted. Had the high command even asked for the bio-data before finalising the campaign committee and secretaries, a majority of them would have been left out, lamented a senior leader. Party president Sonia Gandhi and general secretary Rahul Gandhi had held one-to-one meetings with a number of young and middle-rung party leaders to get a feedback about the political situation in the state and the party affairs. However, it has not made any difference if the latest action of the high command is any indication. As a result, the rank and file is getting demoralised as the elections are drawing nearer. Talking to mediapersons after a meeting of the state executive committee of the federation here today, federation state president Ram Singh, accompanied by some top leaders, said the government should ensure that the retirement age of Class III employees is also increased to 60 years from the present 58 years like all employees of Central and several state governments. He said 60-year retirement age already prevails in HP with regards to Class IV and other Class I and II high officers of the Central and state governments. The Dhumal government must do justice to Class III employees and allow them to go home after attaining 60 years. The federation once again stressed that employees be given benefits of four, nine and 14 years of service, all categories be given pay scales on the Punjab pattern, daily wage be increased to Rs 200 and they be regularised after five years service. SP Santosh Patial said Gulam Ali had taken a lift in this vehicle as his own vehicle had broken down on the way. The injured Murtaza of Ropar, driver Shahbaz Khan of Malerkotla and Mustafa of Chamkaur Sahib were rushed by the police with the help of villagers and passers-by and admitted to the Regional Hospital here. The doctors referred Murtaza to the PGI, Chandigarh, due to the serious nature of his injuries. The vehicle was carrying vegetables to Kullu-Manali and fully loaded. The police has registered a case.